What Makes a Successful Finance Professional? 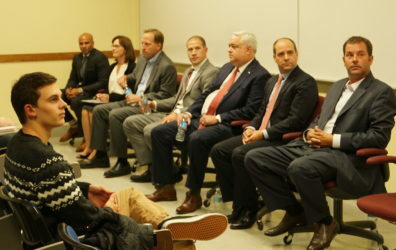 Seven panelists volunteered their time at Finance Professionals Night to help students develop professional perspective. According to a panel of successful finance industry experts, besides a passion for the industry and excellent business skills, it may take a little bit of magic to be an effective finance professional. McWashington was one of seven panelists sharing advice with students during the annual Finance Professionals Night networking event. Jim Oster (’81 Accounting), KeyBank senior vice president and manager, moderated the panel comprised of commercial and international bankers, investors, personal wealth managers, and private industry finance professionals. 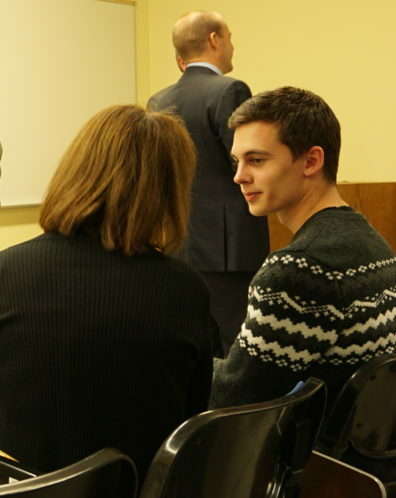 More than 100 participants attended Finance Professionals Night. All of the panelists unanimously agreed that building trust and relationships with clients is paramount to successfully selling financial products and services. International experience and learning a second language also topped the list as key skills that will help students get jobs. While some students may be attracted to the finance industry as a way to get rich, several panelists dispelled the notion of a quick or easy road to prosperity as a finance professional. It takes diligence, good decision-making skills, and rigorous certification to meet the “gold standard,” said Spencer Shelman (’06 Finance, Economics), Palouse Capital portfolio manager. “The Chartered Financial Analyst designation, the top certification for investment managers, is extremely rigorous,” he said. A very low percentage of those that sign up for the Level 1 exam see it all the way through to pass all three levels of the exam. “On average it takes more than four years to complete the process, and many give up along the way because of the frustratingly low pass rates,” Shelman said. He advised students to sign up for level one as soon as they graduate, noting it takes 300 hours of study per each of the three levels. Brandon Rosenbaum (’95 Finance), Ohio National Financial Services sales executive, said he’s on the road 75 to 80 percent of the time and spends 90 to 100 nights a year in a hotel, away from his family. But on the up side, he noted a finance degree can take you anywhere you want to go. John Roehm, KeyBank N.A. senior vice president, stressed the importance of a good compliance record. Roehm advised students who will one day be CEOs to watch for headline risk and to stay out of the news, advice echoed by Rosenbaum. “Anything you do stays on your permanent record,” he said. Linda Nihoul converses with an audience member. Balancing the panelists’ cautionary tips was their obvious passion for the finance industry. Several started out in different careers before finding the right fit. Others advised students to seek out mentors, take leadership roles when available, and pursue the career level where they eventually want to be—through observation, networking, and asking questions. 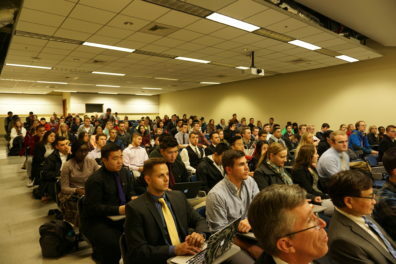 Finance Professionals Night is hosted annually by the Carson College of Business Department of Finance and Management Science. For more information, contact Gene Lai, chair and Safeco Distinguished Professor of Insurance, at 509‑335‑8727 or genelai@wsu.edu.